EMC members gradually gathered on Friday evening in the Bothy Bar at the back of the Atholl Arms. Several people took advantage of the proximity of the hotel to the railway line and travelled north by train. There was a bit of a Scottish theme in the hotel and some were even a little overwhelmed on arrival by the decor, to quote Harry: “Holy cow, this place is wall to wall tartan!”. And Christmas had arrived early in Blair Atholl marked in the hotel by two rather gaudy Christmas trees and decorations – I think it’s fair to say that most EMC’ers were not quite so much in the spirit of Christmas as yet in mid November. The highlight of the weekend was undoubtedly Gillian completing (or is that compleating?!) her round of Corbetts. Almost everyone joined Gillian ascending her final Corbett, Ben Gulabin, near to the Spittal of Glenshee. 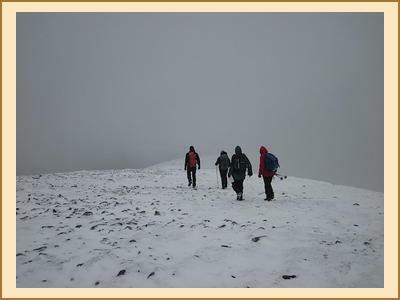 It seems a good time was had by all with more or less dry, clear weather and no snow in sight, a very short ascent, and much feasting on mince pies, ginger cake and chocolate biscuits for about an hour at the top. Gillian arranged hot mulled wine for everyone on the summit using her impressive collection of flasks (apparently there are even more at home!). Despite spending so long at the top it was a very quick up and down – the extravagance at the top of the hill was followed with tea at the bottom in a nearby hotel as early as 2pm. Pete and I headed off to collect some more Munros starting close to Rannoch Station. We headed north east from there and followed the horseshoe ridge which takes in Carn Dearg and Sgor Gaibhre and a Corbett, Meall na Meoig. Winter sun and patches of blue sky at the start were promising but up on the ridge the hill tops were shrouded in cloud the whole time. There was a good covering of snow, even down in the valley by the end of the day which, despite the odd windy blizzard, was very enjoyable. Definitely felt like winter had arrived. Dennis and Jenny enjoyed a lengthy low level walk in Glen Tilt although had to adjust their route for crossing the River Tilt when the bridges marked on the map didn’t quite match the actual bridges in situ. Everyone had dinner together on Saturday evening which was concluded with a memorable speech by Alison C. As ever Harry and Ron got a mention amongst other highlights of the past year, but the main focus, without a doubt, was Gillian. Alison recounted highlights from past meet reports covering Gillian’s EMC ‘career’ since 2002, showing the emerging theme of ‘as many peaks as possible’ in a single trip. Gillian was presented with her own magazine cover for a special edition of “Take a Break”, better known as “Take a Ferry Break”, marking Gillian’s Corbett compleation and EMC ‘career’ so far. The highlighted features in this special edition included Gillian’s tips on how to dress to stay warm in summer, several of her best, and possibly unique, recipes, an article on her snowboarding adventures and some of her top faffing (or is that phaffing?!) techniques. In the bar after dinner, much entertainment was had with gossip from some of the longer serving members of the EMC, and several try outs of various yoga moves, the most impressive of which was undoubtedly Chris’s demo of the ‘plank’ lasting for a whole two (or so…) minutes, which, rather surprisingly, earned him the title of ‘honorary woman’ for the evening! Sunday had a cold and frosty start. A crowd headed off for an ascent of Carn Liath, the first Munro of Beinn a’Ghlo. John & Dennis did the Corbett, Ben Vuirich while Agnes and Jenny checked out the bargains at House of Bruar before walking part way up the hill to meet John & Dennis. Pete and I cycled most of the way into Beinn Dearg with lovely sunny winter scenery and then ascended into a bank of cloud (again!) to reach the summit. 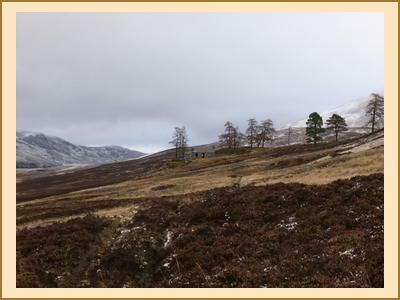 Chris and Sarah had also planned a trip to the House of Bruar for some Christmas shopping and a relaxed Sunday lunch.